In my neck of the world, 8 counties are under weather advisories. What does this mean? High temperatures from 90-95 degrees over the next two days. Heat index of 100-102 (that’s the “Feels Like” section on your weather app). Hottest times are from 2-7 pm each day. Possibility of heat exhaustion or heat stroke (or in the case of a friend of mine: sun poisoning), or heat related illnesses. Drink plenty of water. Drink 12 ounces of water two hours before your workout, and another 12 ounces 30 minutes before your workout. During your workout consume 4-8 ounces every 15 minutes. Drink 12 ounces 30 minutes after your workout. Drink more water in high heat/high humidity situations. Drink more water to lower your body temperature to avoid heat related illnesses, and to replace what you’ll lose while sweating. Avoid caffeine. Caffeine is a diuretic, which can drain water from your body. Limit yourself to one or two caffeinated drinks per day, and drink one glass of water for each caffeinated beverage you drink. I’d suggest two in this type of weather. Consider early morning or late evening workouts. If you enjoy outdoor workouts, consider getting out early in the morning – between 6:00a.m. and 8:00a.m., or late evening between 7:00p.m. and 9:00p.m. You’ll avoid the hotter temperatures of the day. 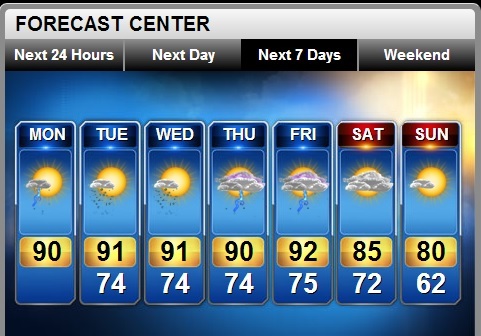 Also, you could plan to be in the gym where it is air conditioned for the heat wave. Other suggestions put out by the heat advisory: Stay indoors and in an air conditioned room/environment. DO NOT LEAVE YOUR ANIMALS OR CHILDREN UNATTENDED IN A VEHICLE!! I scoped several parking lots today while on a walk. I will smash car windows and happily endure being arrested for your stupidity. If you have any additional suggestions on being safe in the heat, post a reply below or send us an email at spdiaries@gmail.com. Water Consumption: How Much Should I Drink? Tuesday Tips: How Soon after Weight Loss Surgery Can I Resume Exercise?